Hero Electric recently released its sales report that highlighted a 100% growth from the last year. Festive season saw a huge surge in the demand for these vehicles with Uttar Pradesh, Uttarakhand, Rajasthan, West Bengal, Karnataka and Tamil Nadu being regions that performed the best. A significant contributor to the boost in sales has been the aggressive marketing and sales strategy of the company during all the sessions. Hero Electric’s wide range of offerings is claimed to be a hit with the customers. The brand offered attractive discounts on chosen models and the facility to buy the battery on EMI – among a host of its special deals. Hero Electric has 70% market share and its Optima model has been the most popular family E-Scooter. 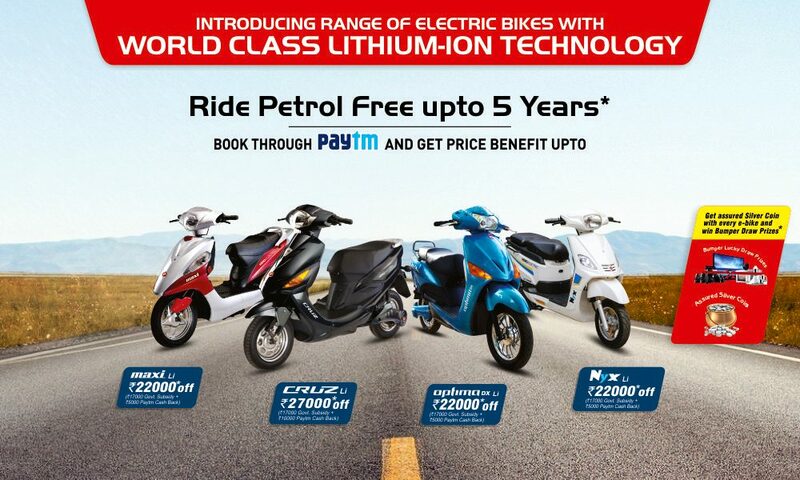 Hero Electric has tied with Paytm and announced an attractive introductory offer of INR 10,000 cashback through Paytm on its range of Lithium Ion Electric Bikes. This is over and above the INR 17,000 subsidy given by the Government on high-performance E-Scooters. Nyx Lithium is yet another useful and functional E-Scooter being launched for the discerning Indian customer. This is claimed to offer versatility, comfort and convenience and Hero Electric is providing INR 5,000 cashback on this product. From Scooter Maxi or the NYX, Hero now has the complete range of its high economy Scooter series in the new Avatar that is aimed to change the way the world looks at the Electric Vehicles.